I never could get on with Thomas Hardy's novels. The themes aren't to my taste, I don't like the characters, the language distracts me from the plot, and everything is so depressing. In contrast, however, I am very fond of his poetry. Admittedly this is quite depressing as well, but can be digested in small bites, and instead of annoying characters, you get a more intimate understanding of the writer. Hardy provides a glimpse into his psyche through an exploration of nature, love, loss, and melancholy. It therefore seems ironic that this nineteenth century author had far more success in publishing novels than he did poetry. 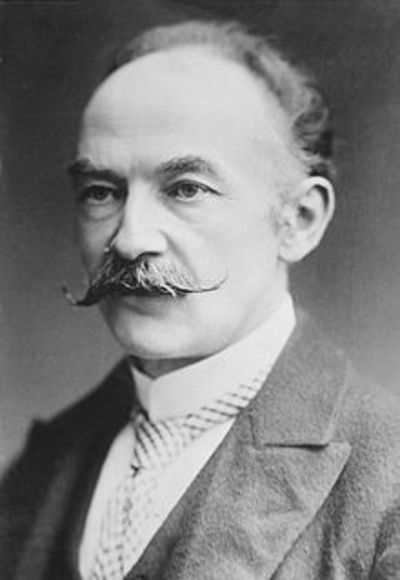 Thomas Hardy was born in 1840, Higher Bockhampton near Dorchester. He left school at sixteen to apprentice as an architect, but also worked tirelessly in an attempt to publish his poetry. But Hardy was writing during the Romantic period, up against poets such as the Laureate Lord Alfred Tennyson. The young Hardy refused to conform to Romanticism's fluidic musicality, in preference for experimental work that was harsh on the ears and used obscure, colloquial, or dialectal terms. After years of no success, Hardy eventually turned to novels. This was a far more prosperous, allowing him to give up his career in architecture and write full time. Now established, Hardy's poetry was now more appealing to publishers, and so, for the last thirty years of his life, wrote nothing else. Between 1898 - 1928 eight volumes were published, (the last being posthumous) tallying almost a thousand poems. Thomas Hardy wrote on a great many subjects, but one theme he kept returning to was that of nature and the countryside. Hardy was very fond of his Dorset homeland, and it features frequently in his work. Most notable is his Wessex Poems and Other Verses collection. One such poem featured is 'Wessex Heights' (1896), which although much more rhythmical than his early work, still has a non-traditional style with sentence long lines that make it look like paragraphs from a novel. Some of Hardy's most poignant work, however, is on the topic of war. In 'The Man He Killed', Hardy calls war 'quaint and curious'. War does not really make sense because although two men are foes on the battlefield, if they 'had but met/By some old ancient inn' they would probably have been friends. Here Hardy is referring to the Boer War, but it could be said of any conflict - just consider the Christmas football match of 1914. Here a young boy who understands nothing of the Boer War in South Africa, fights, not knowing why, and ends up getting killed. He is thrown into a pit, in country that is not his own, with no proper burial or respect. The true tragedy is that we did not learn our lesson. Just a few years later, bright eyed young men went off to France full patriotism and idea of glory, only to die in vain. While I feel that Hardy's novels take a while to get to the point, he is able to convey strong emotions very concisely through poetry.